A 57-year old woman was taken to a community hospital for care following a motor vehicle collision. 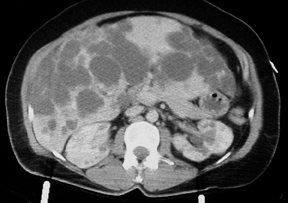 A computed tomography (CT) scan of the abdomen was performed after intravenous infusion of contrast. They show an enlarged liver that contains multiple cysts ranging in size from a few to several centimeters, diffusely spread throughout the organ. The kidneys also contain several similar yet much smaller cysts (> 5 total, bilaterally). The cysts on the kidneys are not very large. The pancreas, at least to the naked eye, is spared. There are no other obvious abnormalities; the patient has no significant intra-abdominal injuries from her trauma. Differential diagnosis: Polycystic liver disease, tuberous sclerosis, autosomal recessive polycystic disease (ARPD), Von Hippel Lindau disease, and multiple simple cysts in the liver and kidneys. The definitive diagnosis of this case hinges upon the patient’s family history, genetic evaluation, and, if necessary, tissue procurement. Based on the radiographic appearance of her liver and kidneys, however, the 2 prime suspects should be ADPD and polycystic liver disease. The former is more likely because of commonality and the absence of hepatic fibrosis. Tuberous sclerosis and von Hippel Lindau (vHL) disease belong to the phakomatoses, a group of neurocutaneous disorders that may have cysts in the viscera. 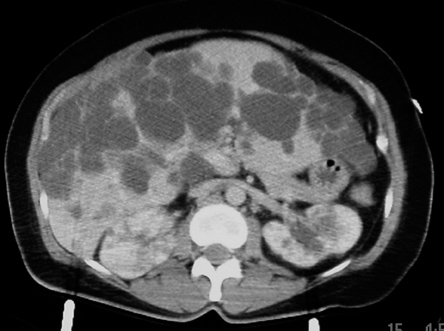 The former may show bilateral asymmetric renal polycystic lesions, but differs from ADPD by the presence of renal angiomyolipomas, and the involvement of the lungs, skin, and brain; vHL disease on the other hand comprises cerebellar hemangioblastoma, retinal hemangiomas, and, occasionally, pheochromocytomas. This patient had none of these. It is uncommon to have this degree of hepatomegaly and bilateral multiple renal cysts due to the presence of multiple simple cysts in the liver or the kidneys. The term ‘polycystic kidney disease’ encompasses both the autosomal dominant (ADPD) and the autosomal recessive (ARPD) forms of polycystic kidney disease. Although there is considerable effort to distinguish the 2 forms of the disease, for obvious genetic reasons, there are cases, in the young, in which the imaging features of the 2 forms are present in the same child, making it impossible to allocate confidently the disorder to a particular category. There have been reports of cases previously ascribed to one form of the disease by prenatal ultrasound (US) that, over time, evolved to the other variant. In children then, imaging cannot hope to provide a conclusive investigative answer, but can complement clinical findings. In adults, the features of ADPD, a confirmed family history of the disease and its imaging features make its diagnosis relatively easy. In ARPD, there is always involvement of the liver by fibrosis with or without ectasia of the bile ducts similar to that seen in Caroli’s disease.3 The patient, always the index case in a family, typically presents younger, but may appear in adolescence with hematemesis due to portal hypertension; the disease, though, is not compatible with longevity and is not a likely diagnosis in this case. Autosomal dominant polycystic kidney disease (adult polycystic kidney disease, Potter type III disease) is the fourth-most common cause of end-stage renal disease.5 Its inheritance is by autosomal transmission and the disease has 100% generational penetrance, but a variable expressivity. At least there are descriptions of 3 genetic variants of the disease;4 85% of cases (PKD1) are due to an abnormality at chromosome 16q13.3, while 15% (PKD2) are due to an abnormality at chromosome 4q21-23. The third genetic locus, yet unmapped, is a rare cause of the disease. There may be cysts in the liver (25% to 50%), pancreas (9%), kidneys, spleen, thyroid, ovaries, uterus, testis, seminal vesicles, epididymis, and the urinary bladder. Other associated abnormalities include saccular (berry) aneurysms of the circle of Willis (10% to 16% of autopsy cases and as many as 41% of patients undergoing cerebral angiography), aortic root abnormalities, mitral valve prolapse, hypertension, azotemia, proteinuria, lumbar and abdominal pain, and abdominal and inguinal hernias. Renal failure is usually a late manifestation. (Being hit by a car, as in our case, is not a reported feature of the disease, yet). Treatment is by hemodialysis, peritoneal dialysis, or renal transplantation. ADPD patients on hemodialysis or peritoneal dialysis fair as well or better than patients with end-stage renal disease from other renal pathologies. Bisceglia M, Galliani CA, Senger C, et al. Renal cystic diseases: A review. Adv Anat Pathol. 2006;13:26-56. Review. Zheng D, Wolfe M, Cowley BD Jr, et al. Urinary excretion of monocyte chemoattractant protein-1 in autosomal dominant polycystic kidney disease. J Am Soc Nephrol. 2003;14:2588-2595. Sgro M, Rossetti S, Barozzino T, et al. Caroli’s disease: prenatal diagnosis, postnatal outcome and genetic analysis. Ultrasound Obstet Gynecol. 2004;23:73-76. Grantham JJ. The etiology, pathogenesis, and treatment of autosomal dominant polycystic kidney disease: Recent advances. J Kidney Dis. 1996;28:788-803. Review. Fall PJ, Prisant LM. Polycystic kidney disease. J Clin Hypertens (Greenwich). 2005;7:617-619, 625. Dimitrakov DY, Dimitrakov JD, Despotov TB. Ten-year clinical and ultrasonographic follow-up of siblings from families with autosomal dominant polycystic kidney disease. Folia Med (Plovdiv). 2002;44:10-12. O’Neill WC, Robbin ML, Bae KT, et al. Sonographic assessment of the severity and progression of autosomal dominant polycystic kidney disease: The Consortium of Renal Imaging Studies in Polycystic Kidney Disease (CRISP). Am J Kidney Dis. 2005;46:1058-1064. Grantham JJ. Mechanisms of progression in autosomal dominant polycystic kidney disease. Kidney Int Suppl. 1997;63:S93-7. Review. Autosomal dominant polycystic disease. Appl Radiol. Prepared by Drs. Ekechukwu, Hecht, and Nwakudu while at Mount Sinai Hospital,Chicago, IL.